With one of the highest rates of child malnutrition in the world, India has won notoriety as one of the nutritional basket cases of the world over the past few years. Global Hunger Index (GHI) for 2017 was released by the Washington-based International Food Policy Research Institute (IFPRI) on 12th October. India performed very poorly by ranking 100th among 119 countries, even below North Korea and Iraq. “India is ranked 100th out of 119 countries, and has the third highest score in all of Asia — only Afghanistan and Pakistan are ranked worse,” IFPRI said in a statement. In 2017, only two other Asian countries were hungrier than India: Pakistan and Afghanistan. “At 31.4, India’s 2017 GHI (Global Hunger Index) score is at the high end of the ‘serious’ category, and is one of the main factors pushing South Asia to the category of worst performing region on the GHI this year, followed closely by Africa south of the Sahara,” it added. As per the report, India ranks below many of its neighbouring countries such as China (29), Nepal (72), Myanmar (77), Sri Lank (84) and Bangladesh (88). What is Global Hunger Index (GHI)? The GHI report comes after the latest 2015-16 National Family Health Survey (NFHS) and cities three points of concern for child nutrition from the NFHS. First, the availability of solid food with breast milk for young children (when they transition from exclusive breastfeeding) declined from 52.7% to 42.7%. Second, the proportion of children between six and 23 months who received an adequate diet was 9.6%. Third, no more than 48.4% of households had access to improved sanitation facilities; sanitation is an important factor in improving nutrition. The GHI report ranked 119 countries in the developing world, nearly half of which have ‘extremely alarming,’ ‘alarming’ or ’serious’ hunger levels. 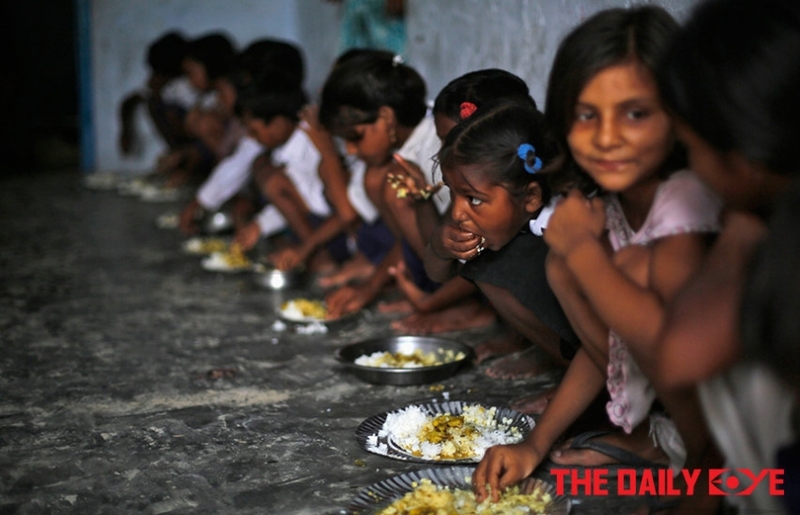 “India’s high ranking on the Global Hunger Index [GHI] again this year brings to the fore the disturbing reality of the country’s stubbornly high proportions of malnourished children,” the statement said. According to the NFHS 2015-16, one in three children under five (35.7%) is underweight, one in three (38.4%) is stunted and one in five (21%) is wasted. Although, India’s malnourishment rates are highly disturbing, India’s GHI score has improved from 46.2 in 1992 to 31.4 in 2017. And in spite of India witnessing significant progress in its battle against child malnutrition over the past decade, the progress has been quite uneven, and child malnutrition rates still remain high in many parts of the country, shows data from the latest round of the National Family Health Survey (NFHS). It is welcoming that India has developed and launched an action plan on ‘Undernourishment Free India by 2022’ as India plans to be hunger free by the year 2022.